Harlan Cohen was at IILJ from 2005-2007 as a Furman Fellow. During his time at IILJ, he researched national security law, international law and legal history. His scholarship has appeared in the George Washington, Tulane, Iowa and New York University law reviews and the Yale, Berkeley, NYU and Michigan journals of international law, among other places. 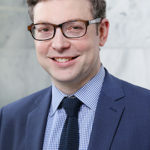 He is currently a professor specializing in international law at Georgia Law School and is the holder of the Gabriel M. Wilner/UGA Foundation Professorship in International Law. Previously, he worked at the law firm Cleary Gottlieb Steen & Hamilton and served as a judicial clerk for Judge Wilfred Feinberg of the U.S. Court of Appeals for the 2nd Circuit. Cohen also interned in the U.S. Attorney’s Office and for U.S. District Court Judge Shira A. Scheindlin, both in the Southern District of New York. Before entering law school, Cohen worked at the Washington Institute for Near East Policy and at the journal Foreign Affairs. In 2013, Cohen was elected to membership in the American Law Institute. Cohen has served as a member of the executive council of the American Society of International Law and served as co-chair of the society’s 106th Annual Meeting. He currently serves as Managing Editor of AJIL Unbound, the online extension of the American Journal of International Law. He also serves on the executive committee of the American Society of of International Law’s International Legal Theory interest group.